So today’s been beyond amazing. 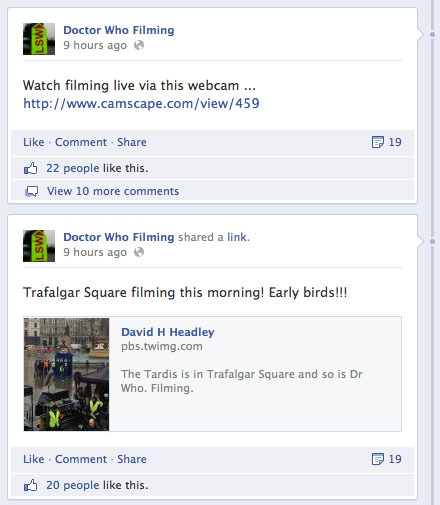 Was just picking up some emails first thing, when I noticed a Facebook comment about filming for the Anniversary Special taking place in Trafalgar Square. Assuming it was a hit and run filming before the world woke up I sorta was only half interested. 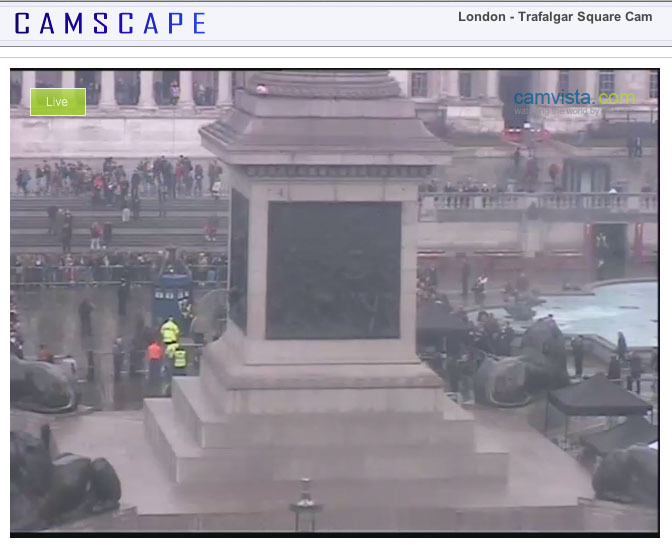 Then I noticed a link above saying watch it LIVE on webcam! Clicking the link only showed some cars stuck in traffic, then the camera suddenly swung around - low and behold the blue box! It was true - and STILL there! So I grabbed my bag, camera and phone and within the hour I was arriving at Trafalgar Square. 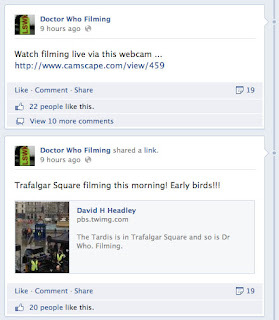 It was nearly lunchtime, so I wondered if I had missed everything, but the TARDIS was still there and filming still underway. I snapped a load of shots, and shot a video of the filming. 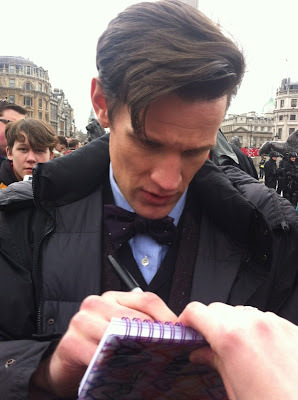 I can report The Doctor is wearing another new shirt, waistcoat and bow tie. The cashmere frock coat, black jeans and boots remain the same. After the brief set-up I watched them film, it was time for the crew to clear the Square ready for a wide shot. While this was happening Matt Smith and Jenna Louise Coleman went along the whole line of waiting adoring fans, signing anything put in front of them. 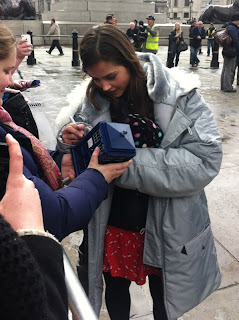 Jenna even signed someone’s model TARDIS! 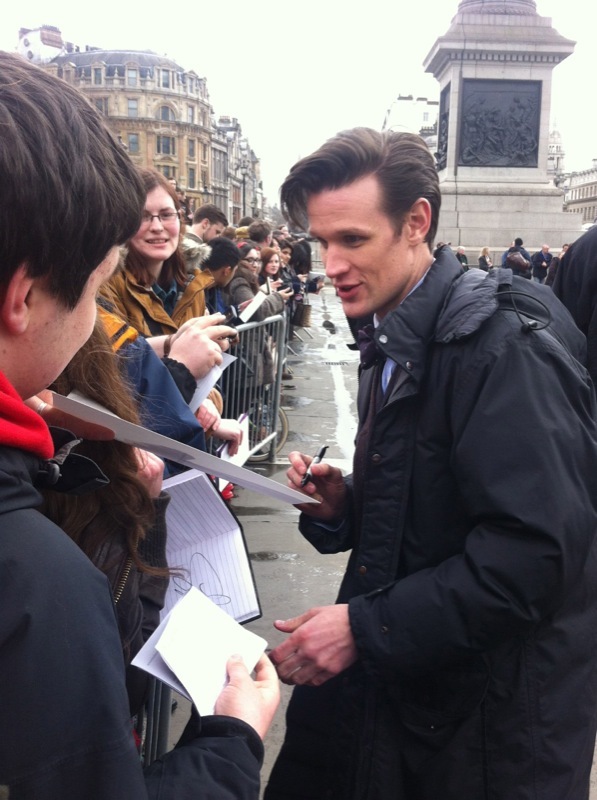 But it was Matt everyone wanted, and he was more than happy to do his best and sign as many as he could. I have great respect for the guy - he’s in the middle of shooting what is likely to be his most scrutinised episode; got to worry about his performance in the next shot; his every move is being watched by hundreds of eyes - and cameras; but he finds time to give a little back to the fans who have been waiting for hours in the cold and London drizzle. Matt proves he is THE man! While he was signing he passed very close to me and I was all eyes over his costume. The waistcoat is a very dark charcoal grey Prince Of Wales check, with a laid-in collar, black buttons with white dots around the edge and four pockets. His shirt is a plain sky blue and his bow tie is a very deep purple with a light grid of dots. I’ve got some more photos to share, so check back soon to see. The filming aroused the interest of the press, where you can see some more, slightly spoiler photos. Motorbike accessories - IDENTIFICATION: POSITIVE!